Shanghai Disney Resort has two hotels—Shanghai Disneyland Hotel (the "deluxe" option) and Toy Story Hotel (the "value" option). 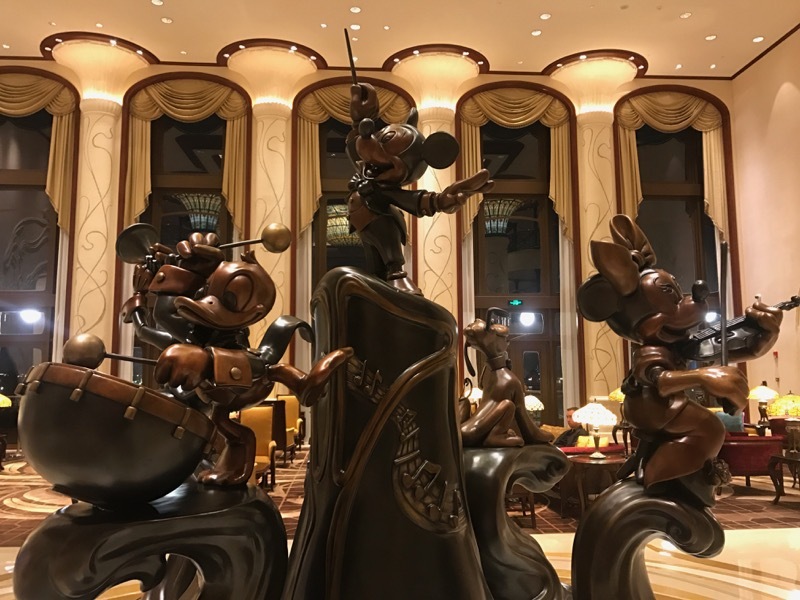 On our first trip to Shanghai Disney Resort, we chose to spend two nights at Shanghai Disneyland Hotel, here's what we thought. We booked two nights at Shanghai Disneyland Hotel online through the Shanghai Disney Resort website. 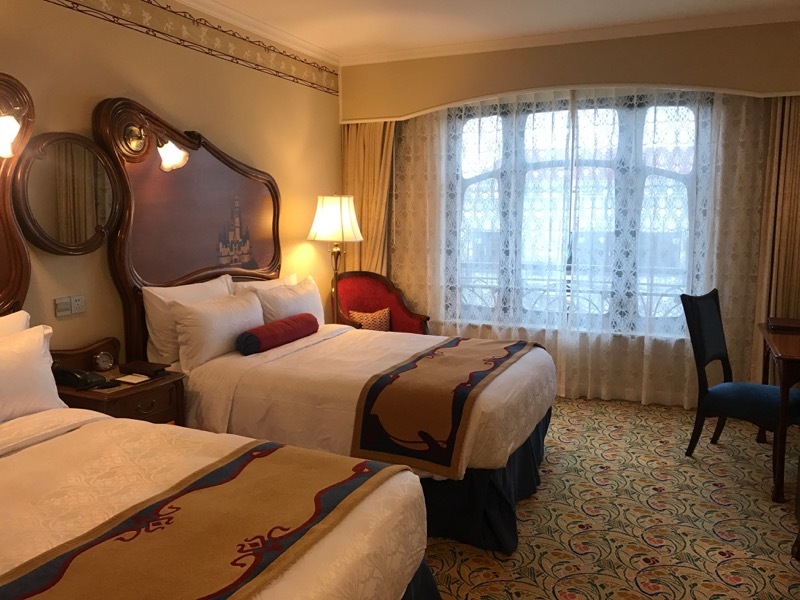 Unlike booking a trip to Disneyland Paris, which has a wide range of booking options, booking through the Shanghai Disney Resort website or via phone are the only ways we have found to book a stay at Shanghai Disneyland Hotel. We paid ¥1,950.00 CNY per night for two nights for a total of ¥4,485.00 CNY after the service charge. At the time we paid, this came to $667.26. Looking at a sample date in June 2018, Shanghai Disneyland Hotel costs ¥2,472.50 for a single night, while Toy Story Hotel costs ¥1,207.50, a pretty steep difference. We arrived at Shanghai Disneyland Hotel after a somewhat adventurous taxi ride at about 11:30AM. We were immediately struck by the spaciousness of the grounds and the lobby. (Indeed, spaciousness is a theme they took perhaps too far at Shanghai Disneyland Park.) The grounds have a gigantic lawn behind them that was mostly unused during our entire stay in addition to having a couple walk-through gardens. The lobby was spacious and artfully decorated in art nouveau style. We spent some time during our trip hanging out in the lobby working on our laptops. Like many of the other flagship Disney hotels, Shanghai Disneyland Hotel has a lobby piano player, which always makes for a nice ambiance. 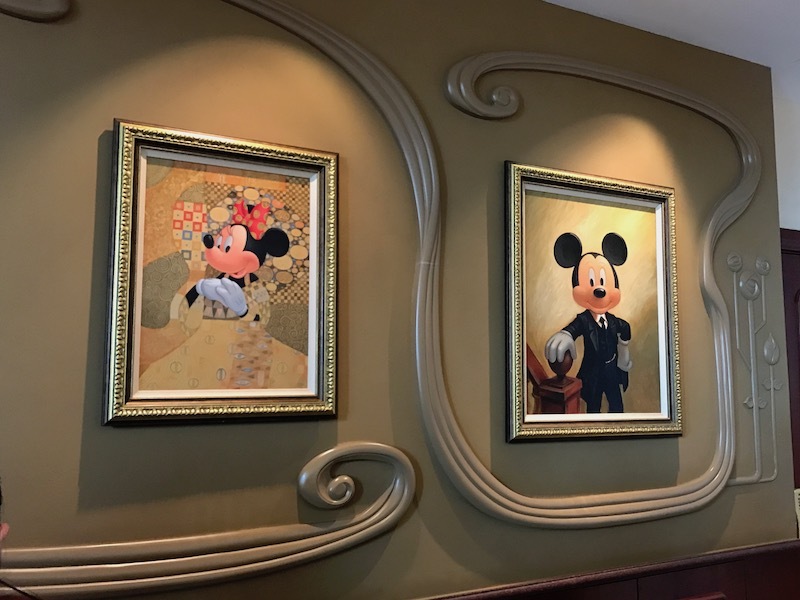 Both Shanghai Disneyland Hotel and Toy Story Hotel are filled with gorgeous Disney art. Browsing these collections was one of the highlights of our resort day. The other thing that struck us immediately (in a very good way) was the smell. As a foreigner, certain parts of Asia smell very unfamiliar, but Shanghai Disneyland Hotel had a very pleasant scent. The final cool thing about both Shanghai Disney Resort hotels is that characters actually walk the grounds. While visiting Toy Story Hotel, we saw Jessie walking around taking pictures with people. At Shanghai Disneyland Hotel, we saw Minnie walking around doing the same. This was a great treat. We didn't expect to be able to check into our room so early, and the Cast Member at the desk politely stated the check-in policy was to come back at 3PM. We left our bags with bell service (who use your booking confirmation number to generate a receipt). As we weren't visiting the park that day, we spent some time exploring the hotel as well as Toy Story Hotel and Disneytown. When we came back at 3PM, we had a brief awkward encounter with a Cast Member who didn't understand our long english explanation that we were returning to get our room, but when we said "Check in" he very gladly and apologetically let us pass to the desk. 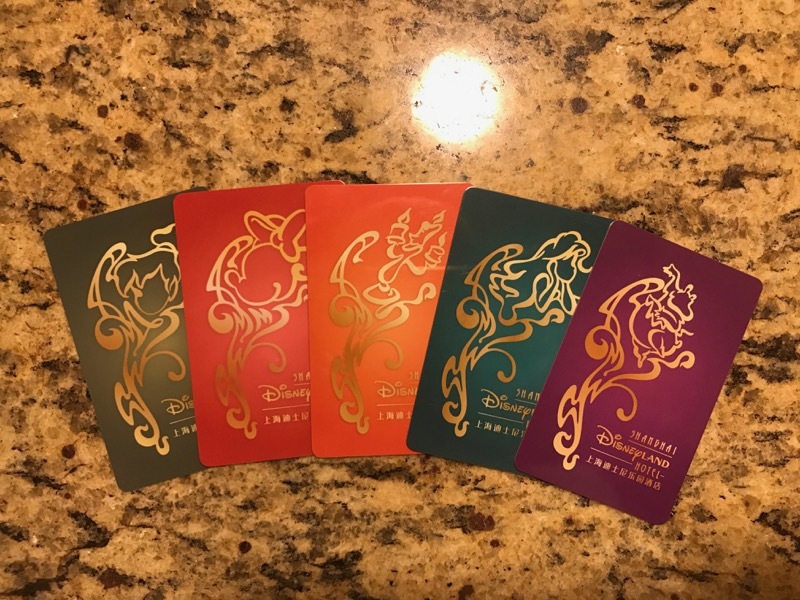 Our room was ready, and the Cast Member at the desk even gave us copies of all the room key varieties just because we were having trouble choosing. Mickey was keeping the lights on. 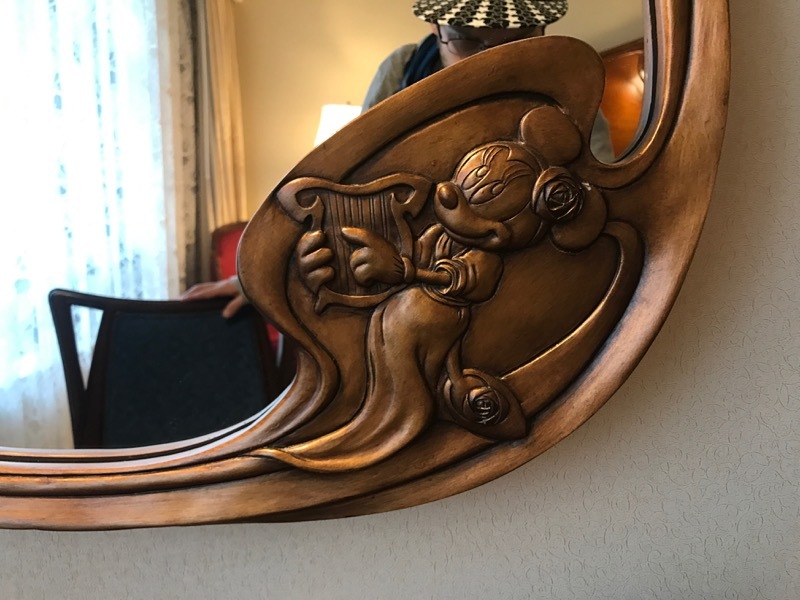 Shanghai Disneyland Hotel reflected the love of characters, and particularly Mickey, that you find across the Disney destinations in Asia. 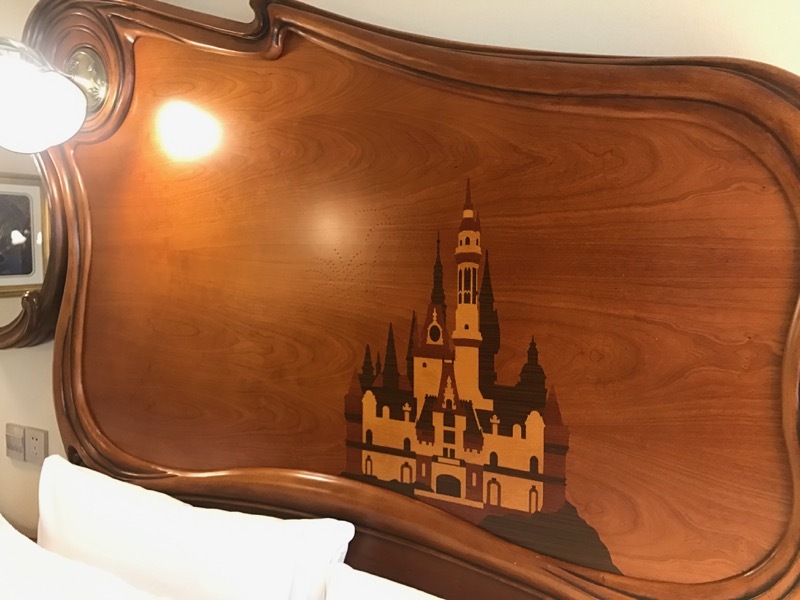 The characters are present in the design here, as they were at Disney Explorers Lodge (Hong Kong), Tokyo Disneyland Hotel, and Tokyo DisneySea Hotel MiraCosta. This is in contrast to Disneyland Paris hotels, like Disney's Sequoia Lodge, which have very little character integration. The room at Shanghai Disneyland Hotel was the first Disney room in a while that really impressed us. Bland rooms at Wilderness Lodge and Disney's Sequoia Lodge left us a little sour on Disney rooms. 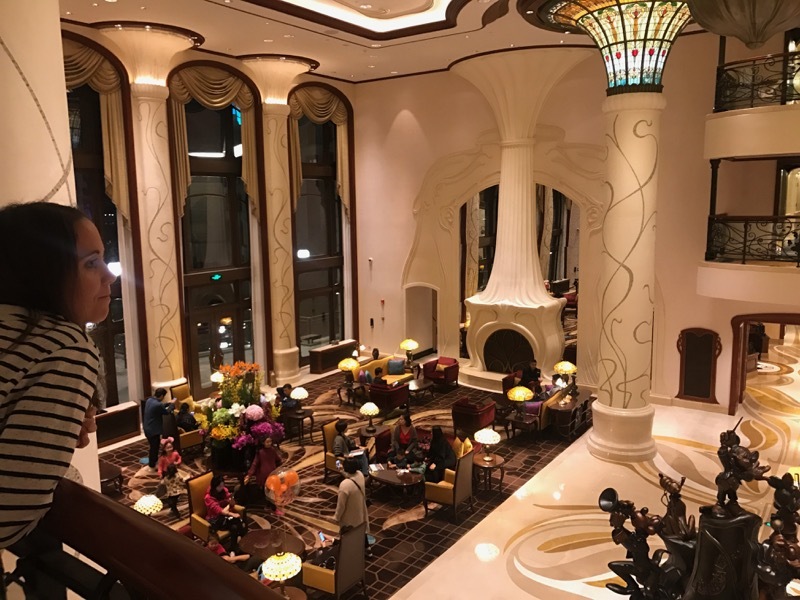 As soon as you entered the room at Shanghai Disneyland Hotel, though, you could tell it was new, nice, and filled with elegant Disney detailing. The TVs had a variety of Chinese selections but, most important for us, a selection of 10 Disney films. This was the first time other than Disney Cruise Line that we recalled having movie access for free on our TVs. With the park closing at 8PM, this seemed a reasonable offering, and we took great advantage of it. The bed was not overly comfortable, but it was soft by Asian standards. The toilets were western-style (with a seat, not a hole to squat over). The one complaint we had about the room was the shower. Our optimal temperature required the knob to be parallel to the ground, but it wasn't designed well and couldn't maintain that position, so it would slide down and become hotter. After holding it in place for a few minutes, though, it stayed put. Our view was of the hotel garden, and it was honestly the only time we've had a garden view that looked on anything of interest. Shanghai Disneyland Hotel is located across a small lake from Disneytown and Shanghai Disneyland. To reach Shanghai Disneyland (and Disneytown), you have three options: bus, boat, and walk. We made the walk in under 10 minutes (7 minutes to Disneytown), but we're fast walkers. The bus came every 10 minutes and took about 10 minutes to get to the park. The boat came every 20 and took between 5 and 10. While Toy Story Hotel is physically closer, the walks are about the same length, so this difference shouldn't factor much into whether you choose the hotel. We're not big dining people (particularly in many foreign countries as we're vegetarian), so for the two main dining options, we're linking you to outside reviews. 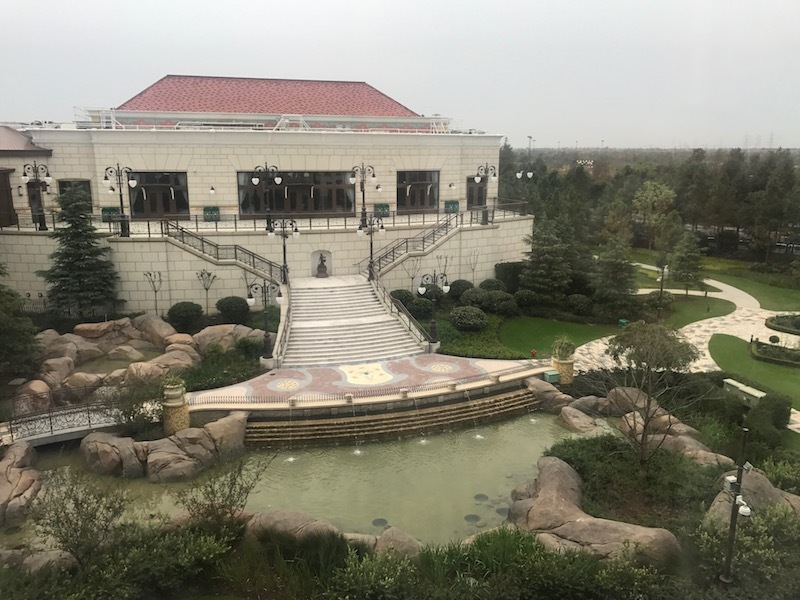 Shanghai Disneyland Hotel offers two restaurants, Aurora and Lumiére’s Kitchen, a cafe, Ballet Cafe, and a lounge, Bacchus Lounge. If you've read our previous content, you probably have gathered that we are, however, bar and lounge people. If we're in a hotel, there's a good chance we're on our laptops in a bar, lobby, or club lounge. Bacchus lounge was a fun, albeit very mellow, place. 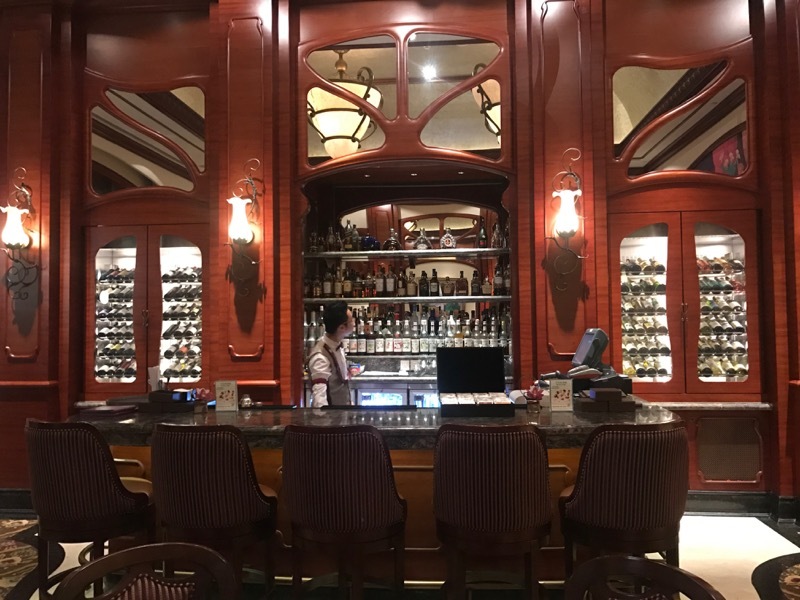 At Shanghai Disneyland Hotel, this meant we spent a lot of time (and money) in Bacchus Lounge. Bacchus (or Dionysus) is (according to Disney Wiki) the Roman god of parties in the 1940 feature film Fantasia. While Bacchus Lounge was an enjoyable time, it was not a party. The first night we were there, the only other people we saw were Westerners (Americans, we think) until 9:15, when four gentlemen arrived. The service was good, though, and we found it to be a pretty good spot to watch the fireworks from. There was some reflection in the window that made it imperfect, but we enjoyed the show. By way of prices, they weren't as high as we experienced at Disneyland Paris's Cafe Fantasia, but they weren't cheap: Tsing Tao was ¥48 (~$7), Stella ¥58 (~$9), Old Fashioned ¥78 (~$12), Tropical Martini ¥78 (~$12). Disney hotel guests have access to a special priority entrance to the park. We didn't know about this entrance while we were there, so we can't comment on its usefulness, and we haven't found much valuable online. When we return to Shanghai Disney Resort, we intend to spend at least one night at Shanghai Disneyland Hotel. While Toy Story Hotel seems like a special place as well, Shanghai Disneyland Hotel is one of the nicest Disney hotels we've stayed at, but with a far more reasonable price point (some nights at $300 per night) than comparable hotels in the United States and Tokyo. 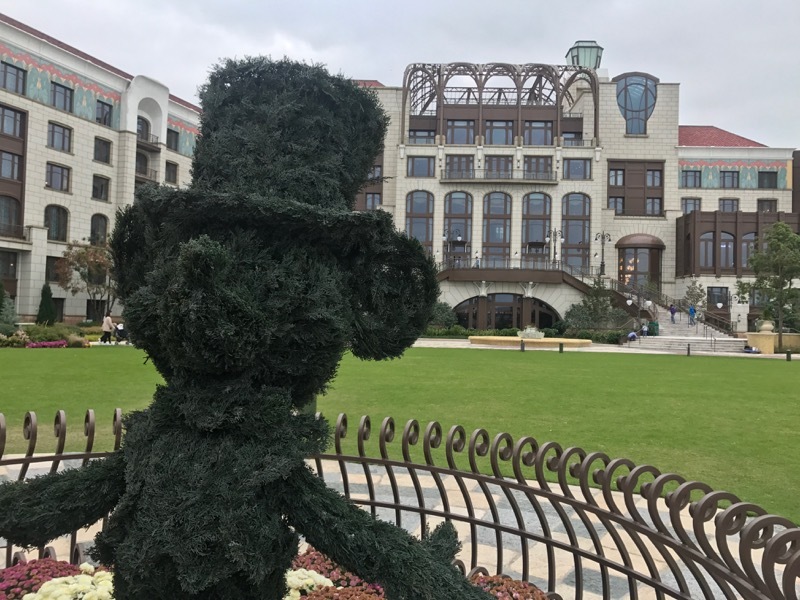 Have you stayed at Shanghai Disneyland Hotel? What did you think?